Their wedding, as well as the birth of their children George and Charlotte have been covered by the world’s media. However, the event that started it all was their graduation from St Andrews University – the institution where they met and started dating. Although they had been friends, William saw Kate in a new light when she sashayed down the catwalk in a daring dress as part of a charity fashion show at the uni. Their graduation marked the start of their life together away from the bubble of university. 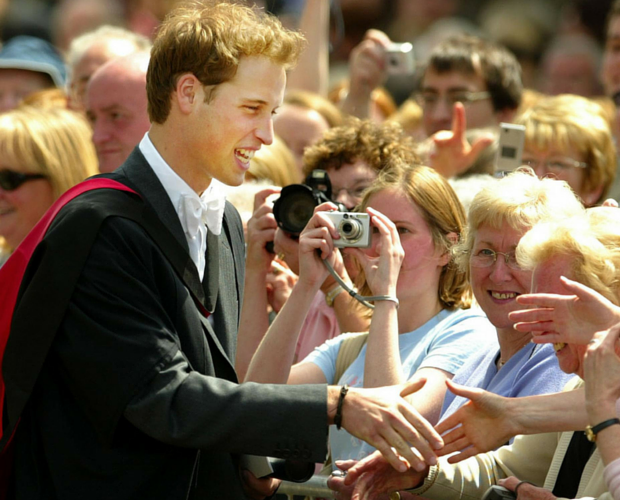 Hundreds lined the streets of the Fife town to watch William graduate with an honours degree in Geography and Kate with an honours degree in History of Art. Looking on proudly as William collected his degree were his father Prince Charles, his stepmother Camilla and grandparents the Queen and Duke of Edinburgh. Public opinion of the Royal family had been lowered during the 90s following the breakup and eventual divorce of Prince Charles and Diana. The Queen was also criticised for her reaction to the death of Diana in 1997, deciding not to fly any flag at half-mast over Buckingham Palace as a sign of royal mourning. However, William’s graduation started a resurgence in public opinion. He and Kate have taken centre stage and their marriage and new parenthood has only strengthened royal standing.